Sometimes I have trouble sleeping. I blame it alternately on anxiety and muscle pain. A few nights a week, I lie in bed, a tired person trapped in an awake body. On nights like these, I often don’t fall asleep until four or five o’clock in the morning. Then, because I don’t want to sleep the next day away, I awaken at a typical morning hour, and spend the day in a near-zombie state. Such was the case last Sunday. Moving, but barely alive. I’ve been running. I started as an excuse to workout outside rather than at the gym. I trained for a 5K, and then a half marathon. Now I’m training for a marathon. The conditions have to be just right for me to go running. It can’t be too hot out, but it has to be sunny. It also can’t be morning, because I am asleep in the morning. Therefore, I mostly run in the evening, after 6:00pm, when temperatures have cooled and the sun has softened. Last Sunday, I was milling about my apartment in that sleepless zombie state, trying to muster up the energy to go for a run. By the time I’d finally talked myself into it, it was past noon, and just too hot out. There were other options. The gym. Hiking up to the Griffith Observatory. Yoga. But I was so tired, I just wanted to float. Outside, resting my muscles under the summer sun, while still moving them in a manner that could be considered good for them. It dawned on me that I could go swimming. There is a public pool in Hollywood, on Cahuenga. I’ve only been once, under a very similar circumstance – I was prepping for a round of cancer-treating radiation. Exhausted, but knowing I needed to move, and wanting to do so outside. It was, after all summertime. I am meant to be outside. The very molecules that make up my physical being are made of fresh air, fresh water. I’m kin of snowmen but from a different climate. A life spent inside is for me, no life at all. I’d melt. So, I put on a swimsuit, packed up a beach bag, and drove myself to the pool. I remembered all of my days spent walking to the pool when I was a kid. In grade school, my sister and I would walk a full two miles to the pool in Riverton, Utah, through the small suburban town, into the rural outskirts, past the farms and empty fields, where there was a beautifully landscaped public pool overlooking the Jordan River valley. Later, I lived in an even more suburban area called Sandy. No farms, just houses. There were two pools in the area – the grander one was two miles away, at the end of Highland drive, a major thoroughfare that climbed steeply from my culdesac. It wasn’t a pleasant walk. The smaller community pool was just under two miles away, along Creek Road. A simple, pretty walk. In junior high school, I spent my summers in Montana, on a small town swimteam. My friend and I would often walk home from the pool, two miles along a country dirt road through the rolling golden hills of Chinook’s expansive farms and ranches. We’d spend the entire day in our swimsuits, running around on the farm, never minding the dirt accumulating on our knees and elbows or the hay in our hair, because we’d just shower it off at the locker room before evening swim practice. My time spent walking to the pool was time spent really feeling the sensation of being alive, of the sun on my skin, the coolness of the water, the invigoration and fatigue of my muscles, my pruned fingertips, my hunger, my crusted hair, my cracked heels from walking long distances in worn-down flip flops. Last Sunday, as I dipped myself slowly into the cool almost cold water, all of these sensations came flooding back. My heart jumped with gratitude for these memories, and for my psyche having gotten my tired self to the pool, allowing this nostalgia to take hold. I also remembered how nice the pools are in the Salt Lake area. Maybe it’s because the Salt Lake City economy isn’t suffering like the Los Angeles economy. Maybe it’s because the Salt Lake area is zoned into many small counties, whereas Los Angeles County is sprawling and unmanageable. In any case, Utah pools are landscaped with lawn and hills and trees. 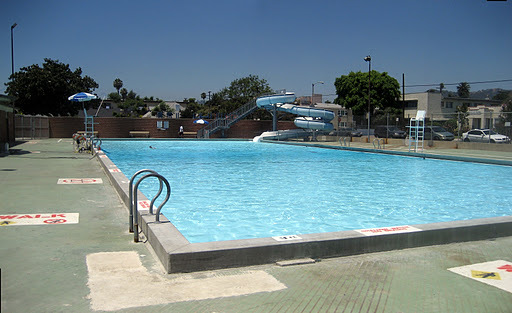 Los Angeles public pools are not landscaped. They are simply holes dug into the ground, surrounded by flat concrete surfaces, and enclosed by chain link fences. 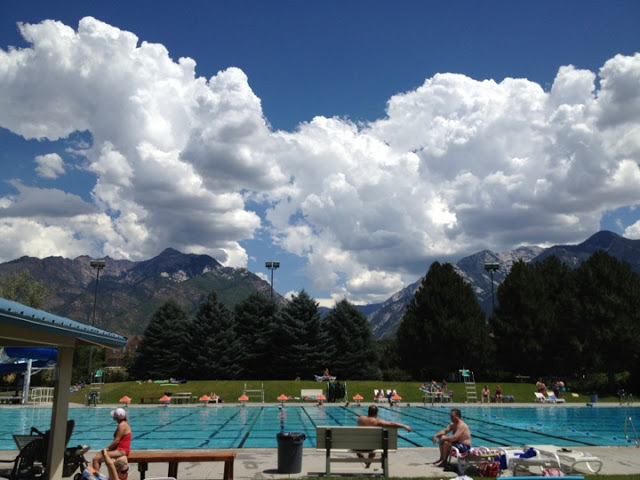 They are only open from mid-June to mid-August (whereas Salt Lake pools are open through Labor Day). You’d think, given the stereotype that Los Angeles is a blossoming summerland all-year-round, that its pools would be lavish and fancy and open most of the year. That may be true for the private pools of the rich and famous, but the public pools are quite bland and under-staffed. That being said, the Hollywood pool is clean and well-kept, if not terribly pretty. After my afternoon swim, I put my wet, chlorine-encrusted self back into my car and drove home with the windows open. “Next time, I’ll walk,” I thought.